The reason I’m writing right now is to ask to light a candle. Because I feel a bit guilty for not writing here for long time, I’ll tell you more about it. The Olympic Games of Shame. It happened in China. Meanwhile, thousands of Tibetans have disappeared or are imprisoned in Chinese camps. – promote respect to the universal and fundamental principles of ethics. A hundred kilometers away from a cultural genocide, thousands of athletes will performed in the name of peace! I’ve gone through so many adventures meanwhile…I have recorded some of them and I’ll tell you about them here or when we meet. In the period I spent in Himalaya I lived among Tibetans and I am deeply impressed by their simplicity, joy and inner peace. They are probably the most peaceful people in the world. In march 2008 had bitter clashes with an oppressing regime that has nothing to do on these lands. 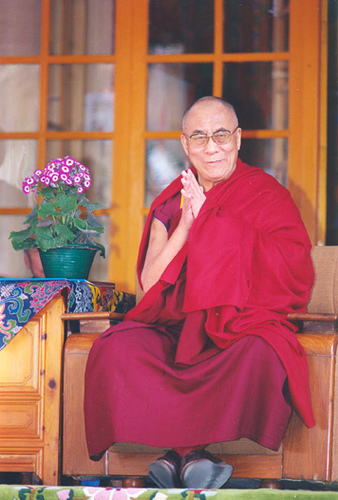 In Dharamsala, India, is the headquarters of the Tibetan government in exile as well as that of Tibet’s political and spiritual leader, the Holy Tenzin Ghyatso, the 14th Dalai Lama. I am here after I solicited, by phone, to be received. A Tibetan official invited me to a the lectures Dalai Lama himself holds. I never could imagine that one day I’ll be given the privilege to sit only meters away from this king of kindness and compassion, to receive his teachings. Security is at a maximum, each day the guards here check me in detail. No mobile phone or camera are allowed. For 5 hours a day Dalai Lama talks to us about soul, path, ignorance, wisdom, truth, body, mind, spirit and enlightenment. At the temple’s gates there are the militants for a free Tibet and for the release of political prisoners as well as lots of journalists and many tourists. 6 of the monks are in their 10th day of hunger protest, with no water and no food. They have fainted several times. I have seen last night a very objective presentation of the actual situation In Tibet, by Robert Burns, journalist and professor specialized in Tibetan studies. Tomorrow in the afternoon we’ll go to an orphanage for Tibetan children, whose parents are in jail or died. Together with some Israeli friends, trained in psychotherapy and/or theatre we’ll organize some interactive games and activities. It actually is that occidental feeling of “I want to do something…”. The children don’t suffer: they have no way to tell the difference and to understand their situation. “March to Tibet”: tomorrow, supporters from India will march between Rajghat and Janta for a free Tibet. Thank you! Right now you are in a harmonious connection with 100 millions more people! The frustration I feel right now comes from the lack of being present, here and now. The surrounding atmosphere can only be enjoyed and this is not enough for me. On one side there are the duties, the promises I have made: the take me back in the past. I am way behind with my notes for the site. I have to talk about things and events that happened and are now finished and this also takes me back in the past. This balancing movement between past and future, with only fugitive moments spent in the present (if I don’t simply ignore the present altogether…) really does affect me. It deprives me of my joy of living, it deprives me of being alive and being in contact with everything that surrounds me. We were raised and conditioned into being materialists. We either are affected by the past and live in its shadows or we eagerly look towards the future to get our… fulfillment. All of this is transformed into a mechanical oscillation past-future, interrupted by brief sparkles of present. The longing for childhood actually is the longing for the continuous and uninterrupted joy, the longing for present tense. There are no other tenses but present tense! Religion also uses the need for time, when it promises a future of… enjoyment of the present! 🙂 Blind as we are, we are looking for the paradise in the future and we fail to notice the beauty, the joy and the love to be given and to be received all around us.